Among the religions and sects that deserve to be represented directly or indirectly at the Germersheim meeting (see last post) are certainly the Mormons. This blog has already reported about the vast conference interpreting operation they run (enter mormons in the Search box on the right for the posts). They’re also prolific written translators, and they have a key sacred text to start from, The Book of Mormon, which says even of itself that it’s a translation. The latest translation to appear is into Lao (see Reerences). At some time you’ve probably been approached in the street or on your doorstep by their missionaries: clean-cut, soberly dressed young people, some natives some foreigners but all speaking the language of the country. For the Mormons believe in reaching out to people in their own language, and the young missionaries they send around the world as a religious duty are enjoined to learn it. I’ve met them in the village where I live on the outskirts of Valencia, Spain. And of course the tracts they hand out and the copies of The Book of Mormon that they offer here are in Spanish. Last week there was an article in a Spanish magazine about Spanish Mormons (see References). There are approximately 50,000 of them, mostly ex-Catholics. It led me to the story of the first Spanish translation of The Book of Mormon. It was made by a Spaniard, but curiously enough not in Spain and not for his fellow Spaniards. Since it involves a trio of Non-Professional Native Translators, I’ll retell the story. The principal translator was named Meletón González Trejo, and he was born in 1844 in Extremadura, then a poor. parched region of Spain. Son of a schoolteacher who gave him a good education, he joined the army and was posted to the Philippines, which in those days was a Spanish colony. On the way, he passed through France and there he first heard about the Mormons. A French translation of The Book of Mormon had been published as early as 1852 (see References). In the Philippines he developed religious doubts and had a dream that prompted him to leave the military and set out to see Salt Lake City. Sailing from the Philippines to San Francisco, he made his way from there through the Rockies and met the Mormon leader Brigham Young, who took him under his wing. Trejo had to be very tough to survive in Utah in those pioneer times. He took part in the heroic rescue of parties of handcart trekkers lost in a winter storm in the mountains. "Brother Brizzee had associated more with the people than I had and talked quite fluently and understood Spanish very well but had not studied the written word so much as I had. It was arranged with good feelings all around seemingly, as soon as I was settled at home that Trejo would live with me and we would work together translating. When brother Trejo came, I rented an office for him where he would be undisturbed through the day. In the evenings we would read and correct together." A first, incomplete version was published the following year (see References). At that point Jones departed to serve as a missionary in Arizona, New Mexico and Mexico, and Trejo was left to complete the translation. It was published in 1886. Trejo died some 40 years later cultivating fruit trees in Arizona. The Wikipedia article on The Book of Mormon is here. Publication of the Book of Mormon in Lao announced. LDS Living, 2012. The press release is here. Virginia Drake. Los "Romney" españoles (The Spanish Romneys). XL Semanal, 2012. The article is here. Le Livre de Mormon, récit écrit de la main de Mormon sur des plaques prises des plaques de Néphi (The Book of Mormon in French). Translated by John Taylor and Curtis E. Bolton. Paris: John Taylor, 1852. For an image of the title page, click here. Trozos selectos del Libro de Mormon; que es una narración escrita por la mano de Mormon, sobre planchas tomadas de las planchas de Nephi (Selections from the Book of Mormon in Spanish). Translated by Daniel Webster Jones with the help of Henry Brizzee and Melitón G. Trejo. Salt Lake City: Deseret Press, 1875. El Libro de Mormon relación escrita por la mano de Mormon, sobre planchas tomadas de las planchas de Nefi (The Book of Mormon, related by the hand of Mormon on tablets taken from the tablets of Nefi). Translated by Melitón G. Trejo and others. Salt Lake City: Deseret News, 1886. 1 vol. The Library of Congress and the University of Utah Library have copies of this edition. Daniel W. Jones. Forty Years Among the Indians, a True Yet Thrilling Narrative of the Author's Experiences Among the Natives. Salt Lake City: Juvenile Instructor Office, 1890. Full text downloadable here. The account of the translating is in chapter XXXIV. The Deseret News is still published. It's so named because it was the newspaper of the ephemeral State of Deseret that preceded Utah. There's a Wikipedia article for it here. Source: Meliton Trejo Genealogy, here. Many people have an irksome bee in their bonnet. Lionel's, over at The Liaison Interpreter, is AIIC and the supercilious, crème de le crème attitude of conference interpreters towards the other breeds. Mine, you may have noticed, is Academia and more particularly academic Translation Studies, with their conference rituals and priesthood, publication norms (I'm struggling to turn my Forli PowerPoint presentation into an article), fashions and careering (pun) bandwagons, university beancounters who use computers to count the beans – and yawning gaps. One gap that this blog has complained about several times is the scant interest in religious translation compared with literary translation, although religious translation has been incomparably important throughout history, more than literary translation, which is so fashionable with graduate students and has produced so many publications in recent years. Religious texts and preaching reach out to all classes of society. Of course in Translation Studies there was Nida, but even he has fallen out of fashion and there's no longer a obligatory quotation from him in the opening chapter of every thesis as there used to be 30 years ago. At the Forli NPIT conference, I called the commemoration of the 400th centenary of the King James Bible "the academic non-event of the year in Translation Studies." Fortunately the popular press and publishers in the English-speaking countries did much better. So to cut the tirade short, it now gives me pleasure to relay the announcement of a mini-conference called Translating and Interpreting in Religious Settings, to be held at the University of Mainz at Germersheim, on the Rhine near Karlsruhe, Germany, from 29 to 31 August, 2013. The link is here. Mind you, it's just one panel (Panel 19) of a much bigger jamboree, the 7th Congress of the European Society of Translation Studies (ESTS), but let's hope it's a wake-up call. Notice particularly the inclusion of Interpreting, a concomitant of preaching. As the conference organisers say, "Interpreting in religious settings has received little attention." That's putting it mildly, though there were two papers on church interpreting at Forli (see Further Reading), and you can find a series of posts about it on this blog by entering church interpreters in the Search box on the right. Most church interpreters are Non-Professional Advanced Native Interpreters. So I might consider going to the conference myself if only I weren't so anti-Academia. For more about Nida, enter eugene nida in the Search box on the right. The website of the famous translation school (FTSK) at Germersheim, which opened in 1947, is here. It has nearly 2,000 students. Sari Hokkanen (University of Tampere). Simultaneous interpreting as service: the case of a Finnish Pentacostal church. Paper to the First International Conference on Non-professional Interpreting and Translation, Forli, Italy, 2012. Angelina Hild (State University of New York). Interpreting the prophetic: loyalty, authority and inspiration. Paper to the First International Conference on Non-professional Interpreting and Translation, Forli, Italy, 2012. Abstract here. About the King James Bible on this blog, enter king james in the Search box on the right. 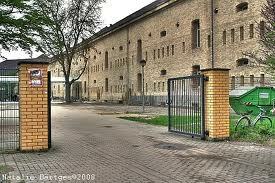 FTSK Germersheim: the original 1947 building, formerly a barracks. Photo by Natalie Bartges, 2008. Battle Creek, Michigan, is a typical American Midwest city. It's famous as the birthplace and headquarters of Kellogg's corn flakes. Like most typical American cities these days, it's home to a sizable community of Spanish-speaking Latinos, and hence there's language brokering. Here's part of a newspaper article that's just arrived from there. “'Can you imagine?' said Flores, executive director of Voces, a nonprofit organization seeking to provide assistance to Latinos in the Battle Creek area. “The memory still makes Kate Flores shudder. “She recounts the story of a local Latino woman who was in the midst of a miscarriage, could not speak English and had no way to make herself understood at the hospital because there was no interpreter. “So instead, she relied on her English-speaking 13-year-old son in the emergency room, the only person she trusted to make herself understood to doctors. “It’s that story, and others too much like it, that convinced Flores and others concerned about the local Spanish-speaking community to get behind Voces, Spanish for 'voices'. “Indeed, language was, and probably still is, the major barrier for immigrants coming to a new country. In this case, children educated in the American school system have a better of chance of communicating than their parents. “In this story, Flores was amazed that a boy had to be involved in a situation so intimate and private because there was no other choice. “‘Not only is it illegal, but it’s inappropriate,’ Flores said. “In the perfect world, Flores hopes Voces will help make sure such a situation rarely happens again." This is the kind of story that riles professional health care interpreters, of whom there are many in the USA. Of course the hospital ought to have had an interpreter available. But let’s do a different take on it. There’s no suggestion that the boy involved couldn’t interpret or caused dangerous misunderstanding. Inappropriate perhaps, but that’s a matter of mores and the boy was “the only person she [the mother] trusted to make herself understood to doctors.” It was her choice. "In the perfect world,..." says Flores. But it isn’t a perfect world. There will always be emergencies where an Expert, or even an Advanced Native Interpreter, isn’t available in time. If it can happen in Battle Creek, how much more is it likely to happen in less developed parts of the world? Conclusion: Instead of having their ability ignored or underestimated, bilingual immigrant children and adolescents should be taught what to do and what to say if they’re called on to interpret in an emergency, and they should be given a basic ‘first aid’ bilingual vocabulary to learn. (Perhaps, in an ideal world, they would also carry a consent form from their parents.) Most children are proud to help. And thanks to TV and the internet, they're much more worldwise than children of their age used to be, which is also a great help for interpreting. But 'what to say' includes telling people they should call in 'a proper translator' if the interpreting is difficult or sensitive. Chuck Carlson. Voces establishes itself in B.C. Latino community. Battle Creek Enquirer, September 12, 2012. The article is here. The emphasis is mine. For another incident where a bilingual boy helped out in an emergency, enter pre-dawn crash in the Search box on the right. We're just back from Santiago de Compostela, a beautifully conserved yet lively town that any cultural visitor to Spain, or any devout Catholic, should see. We much preferred it to A Coruña. Indeed I would rank it up with Granada and Cordova. It's a Christian contemporary of both of them in a green corner of Spain that the Muslims never conquered. I'd gone expecting to hear and see Galego, the regional language (rather than Gallego as I wrote in the previous post, which is the Spanish name for it). It hits you in the eye as soon as you enter the airport terminal at Santiago, in the form of saida, the Galego word for exit. So I was prepared for bilingualism (Galego and Spanish). What I was not prepared for was the multilingualism of the place. For a thousand years, Santiago has been an important place of international pilgrimage. For most of that time the pilgrims came only from Europe, entering Spain over the Pyrenees – I've done it myself over the Somport pass – or, as in the case of the British and Irish, by sea to the Cantabrian and Galician ports and thence on foot. Nowadays, however, they come from much further afield. We fell in with a retired engineer from Alaska. The genuine pilgrims, those who've walked the roughly 750 km of the Camino de Santiago (St James's Way) from France if they started from there, are recognisable instantly by their tanned bodies, sturdy legs and walking shoes, tall walking staffs and heavy backpacks. Their lingua franca is principally Spanish, but you hear many other languages as they talk among themselves. Besides them there are as many 'tourist pilgrims' like us who accompany them as they stride through the old town on the last lap to the spectacular cathedral. Hundreds of both kinds. There's also Latin. Not any more in the church liturgy but in the fascinating Codex Calixtinus. "The Codex Calixtinus is a 12th-century illuminated manuscript formerly attributed to Pope Callixtus II,... It was intended as an anthology of background detail and advice for pilgrims following the Way of St. James to the shrine of the apostle Saint James the Great, located in the cathedral of Santiago de Compostela.. The codex is alternatively known as the Liber Sancti Jacobi, or the Book of Saint James. The collection includes sermons, reports of miracles and liturgical texts associated with Saint James, and a most interesting set of polyphonic musical pìeces. In it are also found descriptions of the route, works of art to be seen along the way, and the customs of the local people. "The book was stolen from its security case in the cathedral's archives on 3 July 2011 and retrieved almost exactly a year later on 4 July 2012." Not surprisingly, it's now kept out of sight in a strongroom. The pilgrims for whom it was written as a guidebook were the tourists of the Middle Ages. The linking of German with Hungarian was a sure clue that the signs dated from the era of the Austro-Hungarian Empire, prior to 1918. Santiago de Compostela. The Wikipedia article is here. The Way of Saint James. The Wilkipedia article is here. Codex Calixtinus. The Wikipedia article is here. 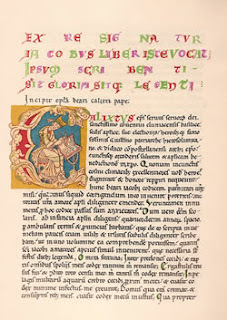 Page from the Codex Calixtinus. Source: http://pilgrimagetoheresy.blogspot.com. Notice the regularity of the black-letter calligraphy. There are 225 double-sided folios. Tomorrow we become ‘climate refugees’ for a few days and take off to the north of Spain for a short respite after the August heat in Valencia. It will also be a new language experience. We’re going, among other places, to A Coruña. 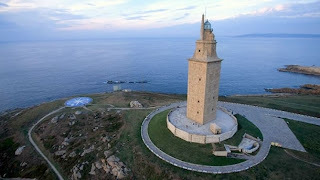 No, not La Coruña, A Coruña. That’s what it’s called officially these days, because that’s its name in the local language. The area, now one of the Spanish semi-selfgoverning regions, is Galicia, and the language is Gallego. It’s linguistically midway between Spanish and Portuguese (Portugal borders the area on one side). I first became aware of it when I drove out of Madrid airport and saw A Coruña on the signs over the highway leading north; at first I thought it was a mistake. But I’ve never heard it spoken because all the Galicians I’ve met, including one who lives on Montreal, were fluently bilingual in their home language and in Spanish. Yet another thoroughly bilingual community. If you want to stand out as a traditionalist, you can still call it Corunna in English. Google Maps does.